We here at Detail BOSS are known world-wide for our paint correction expertise. We really let the cat out of the bag with this one! This 1993 Jaguar XJ220 is an absolute time capsule. The fastest production car at the time, the Jaguar XJ220 was at the top of its game until the Mclaren F1 debuted. We performed our signature level paint correction to bring this kitty up to a show-stopping finish for the Russo & Steele car Auction held in Monterey, California during the infamous Monterey Car Week. A huge thank you to EMG Motor Group for their friendship, trust and the privilege to be involved in this project! 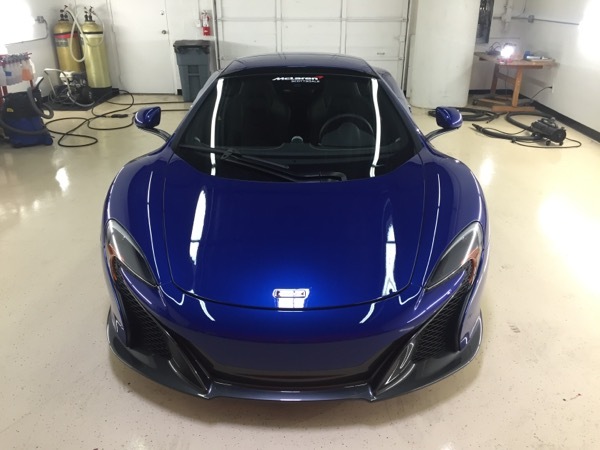 We are located in beautiful Scottsdale, Arizona and take pride in our professionalism and artistic ability when it comes to paint correction and ceramic protective coatings for our clientele's automobiles. Enjoy the video production of what could be a once in a lifetime opportunity! The world's fastest half-mile Porsche entered Detail Boss's doors in need of some major reconditioning. Built by Evolution Motorsports, the 2007 Porsche 997 Twin Turbo is world-renown for going 219.30 MPH in the standing 1/2 mile. Equipped with Evolution Motorsports EVT1700 Package, this German rocket is truly one-of-a-kind. Jeweled to a show-car finish, this racecar became a show-car for the SEMA 2015 show held at the Las Vegas Convention Center. We started off the process when the car was dropped off to our shop courtesy of our client. We cleaned the exterior, wheels and calipers via hot high pressure steam. We removed all paint protection film from the front of the car which was original from 2007, all vinyl and decals to ensure the paint surface was bare for the next step: paint correction. Our Concours finish paint correction was performed next. This consisted of spot-wet-sanding deep scratches followed by multiple compounding, polishing, and jeweling steps to ensure maximum defect removal and the ultimate shine. Upon reaching the final stages, it was particularly important to stress the delicate fashion in which way we wiped off the polish, as well as the type of microfiber towel used to prevent any towel-scratching or marring to Porsche's notoriously soft paint. We also 3 stage paint corrected the door jambs to remove imperfections. Upon completion, we installed 3 layers of Ceramic Pro 9H, and 1 layer of Light to all exterior painted surfaces. We also coated the HRE wheels with Ceramic Pro Wheel & Caliper. Hauled in an enclosed trailer to Las Vegas Nevada, heads turned and cameras came out as the world-record Porsche was started and pulled into the Flex Tools booth inside the convention center for the world to see. We wanted to prove that a race car can be a show car. Our client's EVT1700 Porsche 997 built by Evolution Motorsports did just that. Sit back, grab some popcorn, and enjoy the video showcasing this beautiful transformation. Shout-out to Ceramic Pro for the sponsorship of product for this event. Also a thank you to Bob and Andreas of Flex Tools for having the car in the Flex booth all week long! You guys Rock! Thanks to Evolution Motorsport for your loyalty with our brand and company and for promoting us through various events, social media and to your clients! For more on Evolution Motorsports, click here. Thank you to Evolutionized Photography for the stunning photos, always! To follow and keep up with what we do, 'Like' Detail Boss Facebook Page here.